Did you know you can quickly copy a files path to the Terminal just by dragging and dropping the folder or file into the Terminal window? 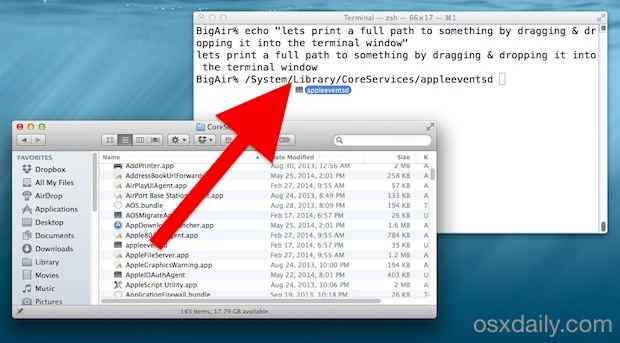 Try it out, open any terminal window then take something from the Finder and drop it into that Terminal, it’ll instantly print out the full path to the file, effectively copying the file path from the Macs Finder GUI to the command line. By itself it will only print the directory structures path, it won’t execute without hitting the RETURN key (which, unless the file/folder path is prefixed with some compatible command string anyway, it wouldn’t do anything). This is particularly helpful when a file is located in an obscure location that you happen to already in within the Finder of Mac OS X, but want to quickly jump to the command line, or just make an edit. Would allow you to quickly change the terminal to the drag & dropped path. Don’t forget to use proper spacing after the command to execute, the path itself is precise and doesn’t include any spaces or extra characters as padding. We had written about similar tip for printing the full paths some time ago and after seeing it again on Lifehacker I realized it was a good reminder to qualify some of the better uses of the trick. For what it’s worth, this technique works in all versions of Mac OS X and even across many other OS platforms, even in Windows with the DOS prompt and most linux versions like Ubuntu. Handy trick, try it out! I don’t understand why all Mac sites decided to make a news about drag-n-dropping into the Terminal. This has been there for years.